We've been on a bit of a tour of the US over the last year. As part of a partnership with The Atlantic, we traveled to Philadelphia, St. Louis, and Denver gathering community leaders to talk about the health of their neighborhoods, towns, and regions--and just what makes for a healthy community. These conversations were designed to examine the barriers to good health and identify opportunities to build healthier communities. In addition, we worked with The Atlantic to conduct a survey of more than 1,000 people across the US to find out how they think their communities are faring. "The Atlantic-GlaxoSmithKline (GSK) National Community Health Check-Up," conducted by Penn, Schoen & Berland this past January, found a strong majority of Americans place a premium on healthcare providers and environment as being primary drivers of their community's health. Despite an optimistic view of health in their communities, significant portions of the US population are not convinced that they have sufficient access to key resources for good health, while 60 percent of Americans say online information is important to their health. Perhaps most surprisingly, 90 percent of Americans consider themselves to be healthy, despite the barrage of reports to the contrary. Americans perceive themselves to be healthy--but don't necessarily see personal responsibility as the primary driver of health. A strong majority of Americans place a premium on healthcare providers and environment as being primary drivers of their community's health. Lower-income individuals, defined as those making less than $50,000 in household income, in particular (55 percent), think doctors and hospitals should be primarily responsible for ensuring good health in a community. 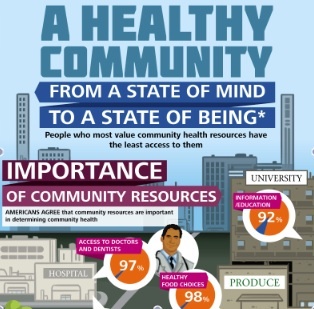 Low-income Americans lack access to community health resources. While Americans believe a variety of community factors are very important to their health, such as good air and water quality (87 percent), regular access to doctors and dentists (82 percent), healthy food choices (81 percent), and nearby hospitals and urgent care facilities (74 percent), the poll found significant unmet needs for the most underserved in this country with those who most value these community health resources having the least access to them. Technology is an emerging source for health information. Americans want technology to become a bigger part of the healthcare system with 64 percent using online health resources and 94 percent of those saying the health/medical information they find online is important to their health. The younger population, in general, are far more prone to embrace and utilize health information technology; however, this group also tends to place greater emphasis on removing face-to-face interaction with healthcare professionals and self-diagnosing their conditions. We continue to ask ourselves what we can do to be a better partner in the communities we serve to ensure Americans have the resources and opportunities they need to live healthier lives. We've learned a great deal already--and we're looking forward to continuing this conversation, and GSK's commitment, to our communities.